Building the SCAMP Sailboat "Argo"
On these pages, I documented progress while building a SCAMP sailboat. My SCAMP sail# is 349, and she is called "ARGO". SCAMP is an acronym for Small Craft Advisor Magazine Project, and was conceived-of by the folks at that publication. 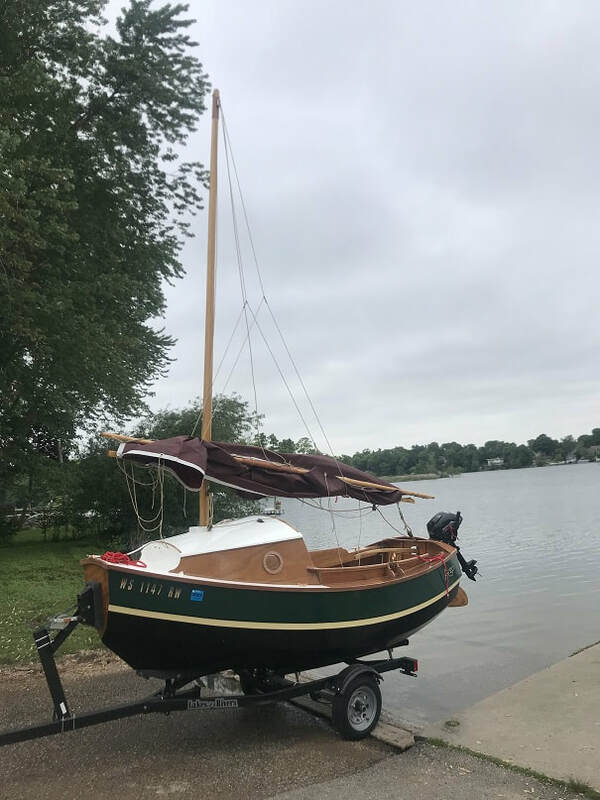 It was designed by New Zealander John Welsford, and a photo of the finished boat along with a video of the first time I sailed her, may be found here on this page. SCAMP Sailboat Argo ready for her first launch. The "Argo" of Greek history was built by Argus, consecrated to Poseidon, captained by Jason, and crewed by the Argonauts on a voyage from Greece through the Bosphorus, around the Black Sea where they won the Golden Fleece, up the Donau, into the Adriatic, up the Po, through the mountains, France, back into the western Med, and back to Greece, on an epic voyage with many high adventures, as detailed in Apollonius of Rhodes' "Argonautika". Jason died when later in life he was sleeping under the Argo and it fell on him. Materials: Joubert Marine plywood, epoxy, fiberglass, Sitka Spruce mast, boom and gaff. I hope you find this SCAMP Build Blog useful. Note that the plans come with excellent instructions, including photo's, from Small Craft Advisor, and I will follow those instructions for this build. Enjoy! Links to the journal of the construction of the SCAMP Sailboat "ARGO": These are generally in the sequence in which work occurred, but in many cases, work progressed simultaneously in many of the categories below. For a true day-to-day sequence of work, you may look at the build-log-by-hour which is the first link below.